Perhaps in no other domain of corporate real estate have boundaries disappeared and lines blurred than in the workplace/corporate office domain. Co-working has become the norm, and the inclusion of employee amenities and alternative places for work, the expected. Our session will look into questions of how this change has impacted your portfolio strategy, including your business plan as a corporate executive, chief people officer or a facilities manager responsible maintaining the health and well-being of the company’s staff or occupants of your buildings. Through an interactive presentation process, attendees can expect to learn strategies to develop agile workplaces that support its occupants and gain insight into organizational development and change management. Arnold Craig Levin, IFMA, principal and workplace strategist, SmithGroupJJR, Inc., Washington, D.C.
We were able to chat with Arnold and Mark to talk about some of the issues driving workplace design and their chosen subject matter. This is a hot topic and we are certain their discussion will pose as many questions as it answers. Corporate Real Estate strategies have changed drastically – your topic, blurring the lines has become a catch phrase – for describing the way work environments have transformed from “uptight” vanilla collections of enclosed, proprietary, assigned offices and cubicle farms to more “free form” collections of spaces for people to choose where and how they work. Is it a fad or truly the metamorphosis of how people engage with each other during the work day? Blurring the lines is a catchphrase – and we are asking ourselves is this a fad a fundamental paradigm shift?” We are more interested in finding out what is causing the need to blur the lines, because that is what will tell us what is real and not just a passing trend. People latch on to phrases and then move on. There are significant disruptions in our industry, caused by technology, the “shared economy” which affect conventional boundaries. Think about the merging of hospitality design, co-working space, Uber, Lyft, transportation and mobility. All these things inform our thinking about workplace, not just the conventional ways people work, but beyond, not just in an office, but the larger environment. This encompasses where buildings are situated, the dynamic of the individual tenant and shared common spaces…there are multiple levels on how organizations are not placing themselves in the larger work environment. This is the merger of Workplace and Urban Design – and we talk about why this is happening. There are real shifts in the economy and how we think about work and life, and these changes are also affecting how architects and designers need to approach their work. How invested are the decision makers in creating spaces that promote wellness/ wellbeing to increase employee engagement/satisfaction etc.? Do they really want to analyze what will work best for their corporate culture (if they can even identify it) or are they just following the trend? The idea of wellness in the workplace is generating a lot of talk, like the discussions in the early days of LEED. Over the next five years organizations will not have much choice but to adopt these initiatives, as the workforce coming in is driving these changes. Companies will be forced to consider the bigger picture in making design decisions around their workspace. Major organizations are integrating these features into their offices now. Balancing work and live is the expectation of the dominant part of the discussions around workplace. The race for talent is dominating client directions. Not every client understands the importance of this, but it is a trend that is moving toward mainstream best practices. The changing work force demographics are dictating the changes on how we approach workplace design. As strategists/designers – how do you bring people on board to really understand and embrace the changes to make a workplace tailored for their company? Encouraging people to change, we try not to focus too much on the trend but more on understanding the substance of what is causing the disruptions in conventional thinking on workplace design. We have the tools to build consensus and to make changes, but there is no easy answer. The key is not to talk about trends, but to make a business case for business improvements, and work design strategies can do that. Changing mindsets, is what we really want to do. The market is going to change and how we think about the engagement on workplace design is affecting all segments of the process from the end user, broker and design communities. We all need to understand a lot more about human interaction and how that happens in the places where we work. We look forward to sharing these thoughts with the attendees of our seminar! During her tenure at IIDA, Cheryl has experienced eight office moves. The most recent relocated the organization from longtime home at the Merchandise Mart to an iconic Mies van der Rohe building at 111 E. Wacker Drive. We asked Cheryl for a bit of background on this new iteration of the association’s workplace and how that has affected her and the staff in the year since the move. 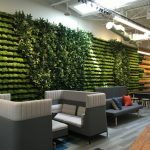 “Not a week has gone by without someone taking a tour.” The new space exemplifies bringing the best of current design thinking as it relates to the workplace, yet it was also designed with a nod to the personal and cultural influences that manifest in some of the design elements within the space. Creating a livable office that was emblematic of what we as an organization that promotes interior design was vital. Being on the other side of the design process was also informative as it shed light on what our members and their clients deal with during their daily work. Cheryl had some interesting insights on how clients and their designers can ensure success and bring the best solutions forward for their project. Cheryl and co-presenters will discuss how workplace designers are creating human-centered workplaces that not only reflect and support a corporate culture but the individual needs of the people that work there. Join them for what promises to be a spirited and informative discussion. Whether traveling for work or play, women are making the bulk of decisions for booking hotel stays. Recent data helps answer the deep design questions: What is resonating for traveling women; and how do their preferences also transcend gender? In this session, you’ll learn about the latest research on the trends being driven by female travelers. From in-room fitness amenities to on-site group activities to smart safety features, it’s more important than ever for hospitality designers to design with women in mind; and in turn, to engage and delight each guest from check-in to check-out. The largest workforce generation in history continues to disrupt perceptions of business and leisure, of and travel. In doing so, this generation is seeking to explore something new and expand their horizons. In this seminar, we’ll ask the questions with serious implications for workplace designers. For example, how are workplaces and travel spaces evolving and blurring to respond to the satisfaction drivers of this cohort? Given that engagement and loyalty are now equally valued in the worlds of work and travel, understanding the parallels and reciprocating nature of these has become a design imperative. You’ll also learn how leisure opportunities are influencing, attracting and retaining employees.